Building Inquiry into Physical Education – CONNECT! Last week, our Physical Education team met in order to weave more ‘inquiry-based learning’ into the way Phys Ed is taught at our school. The team came away excited about the planning session, and is now making two significant changes to the way the Phys Ed program is being presented this year. 1) Enduring Questions. After much discussion about the long-term goals of the teachers, we boiled down the vision of the P.E. program into 2 questions. These questions are given to the students as a way to weave common threads throughout all the different units. How did you best develop your skills? What makes an effective team member? The purpose of the first question is to move students beyond the basic, what skills did you learn this unit/year, to begin thinking about how they develop their skills. The desire of the teacher was to move students toward being self-directed, become better at self-assessing their skills and abilities, and to put the onus on students to identify areas for improvement. The goal is to help students think about learning resources for skill development other than the teacher. As a way to build more authenticity into the project, the Phys Ed team is also hoping to get local athletes to provide their own answers to the two questions. They’re wanting to collect video podcasts of the athlete’s responses to be shared with students. The purpose of the second question is to have students reflect on the particular attitudes that our P.E. teachers nurture. As the students move from sport to sport, each unit is designed to have a different attitude that is stressed, for example: leadership, risk-taking, or goal setting. The question what makes an effective team member is a way to pull together all the different attitudes that are presented throughout the year. 2) Portfolio Based Assessment. This year our Fine Arts and Phys Ed team are adopting portfolio-based assessment, and moving away from traditional report cards. In Phys Ed, the two questions: How did you best develop your skills? and What makes an effective team member? will become the focus for the student portfolio. Here’s an example of the year plan from our grade 4-6 Phys Ed teacher, outlining the units covered, the skill development, the attitude stressed and the form of assessment used. Each student will have their own blog, and are being asked to capture evidence (written, video, image or spoken) from their Phys Ed classes that answers the two questions. At the end of each term, students will be responsible for compiling and sharing their findings to their parents, using their blogs to host the evidence of their learning over the term. Overall, the Phys Ed team is excited about the possibility – although there’s some healthy fear and concern about this new direction. We’ll be sharing the results as the students begin to collect artifacts of their learning. This is a great idea! I think that the portfolio based assessment along with the student blogs will without a doubt improve student learning in your physical education program. I really like the idea of using the blogs to share their findings to their parents and to show evidence of their learning over the term. The blogs are a great way to archive the learning that teachers and students do, facilitate reflection and metacognitve analysis that may have been difficult in the past. Most importantly it will accommodate and support different learning styles. I'm really interested in your study and look forward to seeing your result. Thanks for the comment Greg. We've been rolling with our blogs/student portfolios for about a month now – and are still working out some of the bugs. It's a big transition to go from traditional report cards to a student-directed portfolio system. That being said, we really excited about the work that students are starting to create. We'll share some of the Phys Ed reflections shortly. Thanks for the response. I’m really interested in how you incorporate the student blog as an assessment piece. I have a few questions about how you initially starting using the blogs. Is there anything in particular that you had to do for students, parents, and even administrators before using the weblogs? I have tried to access my own blog and the district blocked my website due to safety. 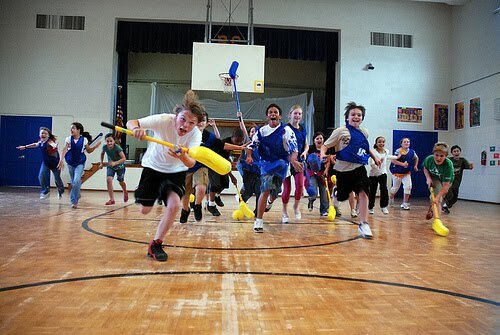 Do you use physical education classroom time or do the students blog at home? I want to experiment with blogs in my health and physical education classes, but I want to make sure that I understand the role teachers must take. Hi Greg, some great questions.. we're asking some of these same questions as well as we're in the midst of adopting portfolios. The move toward portfolios in Phys Ed in partnered with our Fine Arts program doing the same. We don't have any problems with our sites being blocked by our district for a couple reasons (1) we're an independent Charter school so we make all our own internet filtering decisions in-house, and (2) we are hosting all the students blogs from our own server. Also, we're a 1:1 laptop school, so students are able to take their laptops home – which means some of the work of adding work to their blogs can be assigned for homework. So far (we're only about a month into actually having them all set up) the work of setting up the blogs and communicating the expectations has been done during phys ed time. We have communicated this shift to parent in a number of formats. At the beginning of the year, we sent home a letter outlining the reasons we were moving to a portfolio-based assessment system. We also had information sessions during our first 'meet the teacher' night at the school. Right now we're about a week away from our first student-led conferences of the year, and again, we'll be focusing on communicating the expectations of the blogs. One of the key elements that we've talked about is the need to have clear a understanding of what the blogs are for. A significant piece is setting key learning objectives for the students, so that the work they're collecting and reflecting on is directed toward specific outcomes. In phys ed our teachers have talked about the key skills they want to address, and then communicate these to students in advance, so students are clear about the targets they are shooting for. Hope that helps a little.. please feel free to continue asking questions! We're so new to this as well, and and definitely don't have all the answers… but it's an exciting journey. Like you I am a PE teacher at a Charter school. I am looking and thinking about using inquiry-based learning in my courses next year. I would love to correspond with you further, because I think this is a great idea. How do u suggest we do that? Hi Anonymous. Sorry for the late reply. Just checking our emails half way through summer break. We would love to share some ideas around Inquiry and PE – if you send me an email (neil.s@calgaryscienceschool dot com) we can explore ways to move forward. Enjoy your summer! Where is your Inquiry Based Learning for Physical Education research from? I am completing a research paper and would like to implement this curriculum next year in our new STEAM school. Hi Niel, Good to drop by in your blog…I am doing inquiry based teaching also here in my school in Indonesia and almost the same assessment as yours however in the report card we can't avoid giving numerical or letters based on rubrics. What are you doing with regards to reporting to parents about students total achievements? Thank you so much. Hope i can hear from you soon….